There is a bit to get organised so allow yourself a couple months before your track debut. You will need to be a member of a CAMS affiliated Car Club, and also be a member of MSCA (Marque Sports Car Association of SA). If you are not a current member of a CAMS affiliated club, as many clubbie owners weren't, you can join the Spite Car Club for $30 per year. For application or more information call the Sprite Car Club on 0418 802 922. You will also require a CAMS Level 2 Speed (2S) license, which will set you back $85 per year. See the CAMS website for more information. Allow yourself a couple of months to get this organised. When joining MSCA, you will be assigned a racing number. This must be displayed on the left hand side of the Clubbie, usually just before the windscreen. Note that it should be a on vertical surface, and not on top of your bonnet. You will need a helmet which confirms to the appropriate design rules as specified by CAMS and make sure it has no chips or cracks. If it has, buy a new one as officials will not allow you to wear it. In car you will need an approved fire extinguisher, in a metal bracket, within arms reach. It should have a clasp which allows easy access. All forward facing glass (except windscreen) requires plastic protection. Clear vinyl tape on headlights and indicators will be O.K. Officials need to know where the battery is, so a blue triangle is placed on the panel adjacent. Bonnets require an additional tie-down should the main catch fail, however most clubbie bonnets already have a number of catches, so this shouldn't be a problem. A thick nylon cord can be used if necessary. Your seat belt / harness must be fully operational and not bearing any nicks or wear marks. Also 3" harnesses need to be within expiry dates. Full details are available from the MSCA supp reg document. 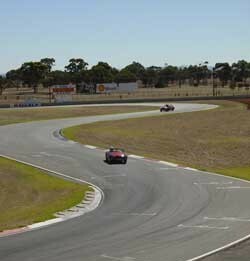 A great piece of advise for first timers is to get acquainted with Mallala at a practice day. 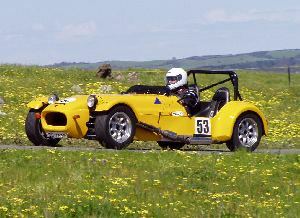 The days are held regularly, and they will give the time to get to know the circuit with the pressure of lap timing etc. The current cost is $75, and check the Mallala website for dates. Practice days are separated into a number of categories, such as closed cars, open wheelers, bikes & go karts. Fortunately Clubbies are classed as open wheelers, which means you don't have to fight with the doosh doosh boys in their Skylines and Commodores, and that there are never many cars on the track at one time. The down side is you may have to deal with Formula Fords and other such beasts going quite a bit quicker. Just keep your eyes glued on the mirrors !! The cost of a Sprint Day is $75.00. Download the application form from MSCA web site, and ensure it is lodged with a cheque by the closing date - usually a couple of weeks before. Whilst at the MSCA site also download the Scrutineering Form, and fill out the top half. This will save you time on the day, but you can get the form on the day. Saturday, check your oil, brake fluid, radiator level and tyre pressures. (it's easier to let air out than pump them up). Check each wheel nut with brace to ensure they are all tight. Remember that Mallala is recognised as the toughest track in Australia on brakes, so make sure the pads/discs have plenty of life left. Get your paperwork together - CAMS license, MSCA license, Club license & scrutineering form. Keep them in a zip lock bag and put it in the car NOW. If not you wouldn't be the first competitor to turn up at Scrutineering without your license. Round up your helmet, tool kit, jerry can and anything else you are planning to take. 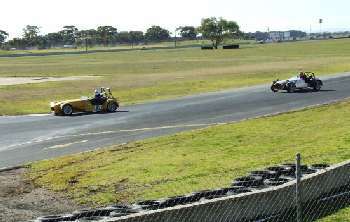 Mallala is a very exposed place and clubbie drivers in particular are at the mercy of the elements. Come prepared with Sunburn Cream, hat and wet weather protection. And don't forget about those cloth seats. The garbage look is not attractive but is effective. Stay off the grog Saturday night. Try and have an early night so you are 'fresh' for Sunday morning at Mallala. You will need to leave home about 7.30am to be at the track (63 km from the GPO) by 8.30 - 9am for scrutineering. Clothing - wear clothing that covers you from neck to ankle - no shorts or short sleeve shirts for example. Wear footwear that is comfortable and safe for driving - no thongs or sandals. On arrival unload your car prior to scrutineering and attend to any paperwork or car details. Any loose items in the cabin, e.g., mobile phones/street directory etc. should be removed. There is no point in carrying around excess weight so remove your spare tyre, jack, brace, tools and anything else that is surplus. Lunch can be purchased at the track but it is a good idea to bring drinking water as you will feel the need most times you step out of your car. You will probably feel more tired than usual on Sunday night - a good sleep is guaranteed. Scrutineering commences from 8.30am, so get yourself over to the shed and into the line. Each competitor is required to do 4 practice laps to record a starting time. From that time you are grided up for the first run. At about 11:15am the drivers briefing occurs at the Scrutineering shed. After the briefing the first time drivers are taken aside for additional information. This includes the starting format where first time drivers are requested to raise there arm on the grid, which will give them a solo start off the line and into the first corner. The days sprinting consists of 3 runs of 4 laps each. From your best practice time, cars are grided up in groups of 10 cars, starting with the fasted. The theory being that you will only ever be competing with drivers with similar lap times. Each print consists of a warm-up lap followed by 3 timed laps. There will be approx 10 cars on the track at any one time. You do not race as such but are let away from the start line in pairs at intervals of a couple of seconds. First time drivers are released individually. The thing you are trying to do is better your last best lap time. Should you be in a situation where you need to pass a competitor, do it only on the straights - not into corners. Keep an eye on your rear vision mirror, as someone may be looking to overtake you. 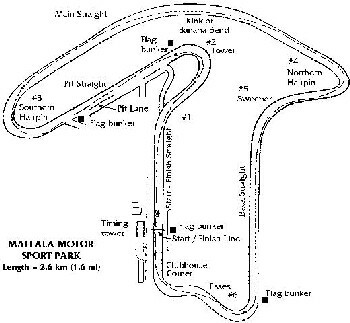 After you have finished your 4 laps, your brakes will be very hot and in fact continue to heat up when you stop, so many competitors, when they return to the pit area, continue to drive their car out of the raceway and towards the Mallala township. A couple of kilometres will allow the brakes and motor to come back to normal operating temperatures and avoid the disc/s possibly cracking. Waved Blue to indicate caution, usually because someone is behind you. Waved yellow indicates a problem on the track roadway itself so be prepared to stop at any moment. The red flag. If for some reason the track needs to be cleared a red flag will be shown by officials. When you see it, slow down carefully to pit lane speed and make your way back to the pits until the track is cleared. The black flag will be used on anyone who does not obey these rules or who causes a dangerous situation for others on the track. Safety Car slow and form up behind the Safety Car - no overtaking.